The expedition cruise ship MVOrion arrived in Hobart, Australia, at 0900, Tuesday 22 January, having diverted from its planned course (heading to Macquarie Island to conclude its expedition to Antarctica) in order to attempt to rescue French solo yacht sailor Alain Delord whose yacht's mast had broken into three pieces and the hull subsequently damaged in heavy seas. 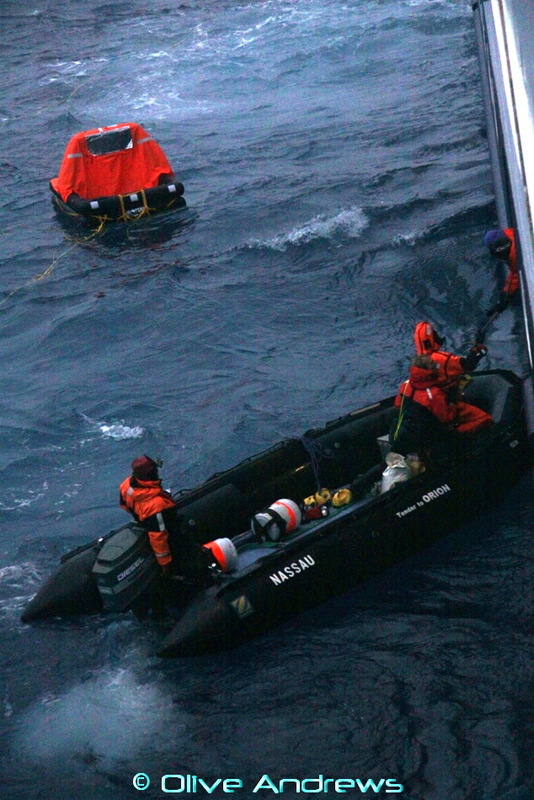 Responding to an emergency request from AMSA (Australian Maritime Safety Authority), Orion, being the closest ship to the search zone, yet 687 nautical miles away, diverted course for a two day rush to save Alan Delord, who by that time had abandoned his yacht and was in a life raft. Royal Australian Air Force search aircraft were deployed to locate the sailor, now adrift In the Southern Ocean encountering 7 meter swells and winds gusting to 40 knots. Following a sighting by the aircraft a raft containing communications equipment, supplies and a survival suit, was dropped and communication commenced on an hourly basis through a French interpreter. 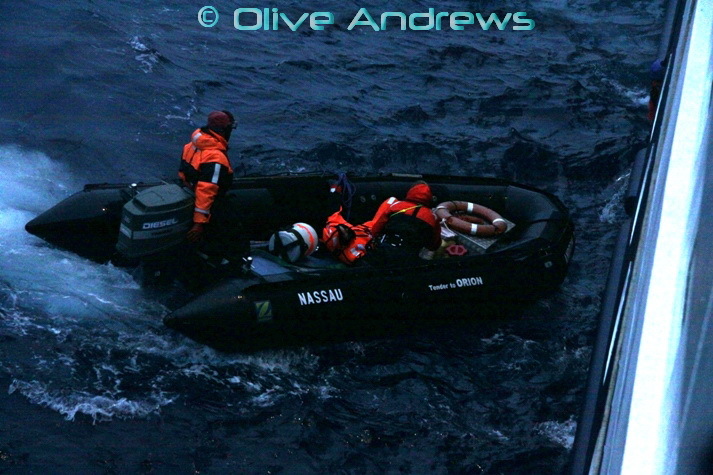 The sea conditions hampered Orion's speed during the 54 hour race to reach Alain, arriving in the search zone at 8.30pm Sunday 20 January, as light was starting to fade. Guided by an RAAF Hercules dropping flares to guide the way, the crew of Orion located the life raft 380 nautical miles south-west of Hobart and Captain Mike Taylor put the rescue plan into action, positioning the 104 metre Orion to windward of the raft creating a relatively calm patch for a Zodiac to be deployed. 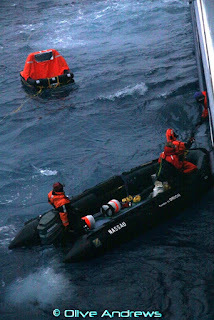 Encouraged by the 91 cheering guests onboard Orion, the rescue team, headed by Expedition Leader Don McIntyre, himself a former solo round the world yachtsman, quickly secured the life raft, extracted Alain Delord and transferred him to the security of the ship in a matter of minutes. In the medical centre the ship's doctor Chris Bulstrode, a specialist in trauma medicine, examined Alain declaring he was in remarkably good condition for someone who had been through such a harrowing experience. A suite had been prepared and following a dinner of lamb shanks, a glass of wine and a cup of tea, Alain went to bed. Relevant maritime authorities informed, Orion set course for Hobart. With an earlier than scheduled arrival in Hobart, the Orion team worked quickly with local authorities and suppliers to arrange guest visits to Port Arthur, Maria Island and South Bruny Island, while Alain received new documentation from France to allow for his entry into Australia. Orion's Facebook page achieved record visits as past passengers, the world's media and general public followed the unfolding of the rescue. On the BBC's website the rescue footage trended as the second most watched video. Positive comments have been flooding in to Orion Expedition Cruises full of praise for the way the rescue was conducted seamlessly in conjunction with AMSA.